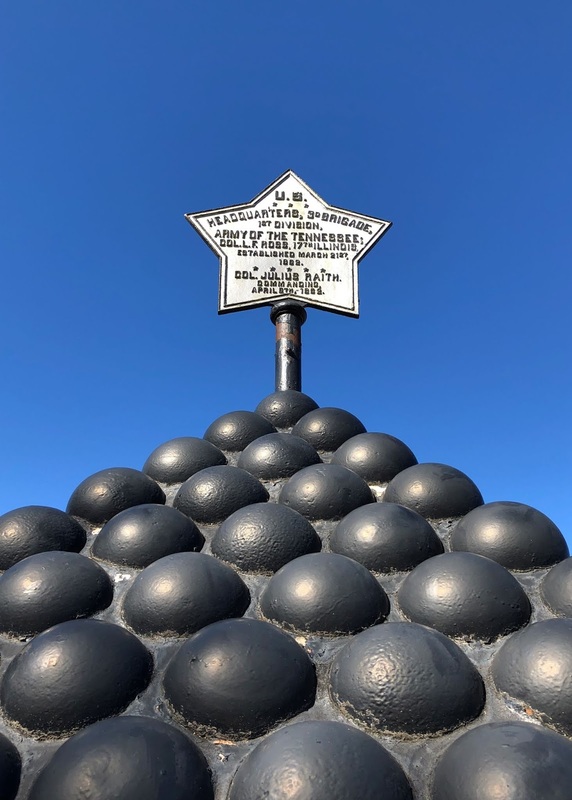 Headquarters for Union brigades or divisions are designated with these signs atop cannonball pyramids. 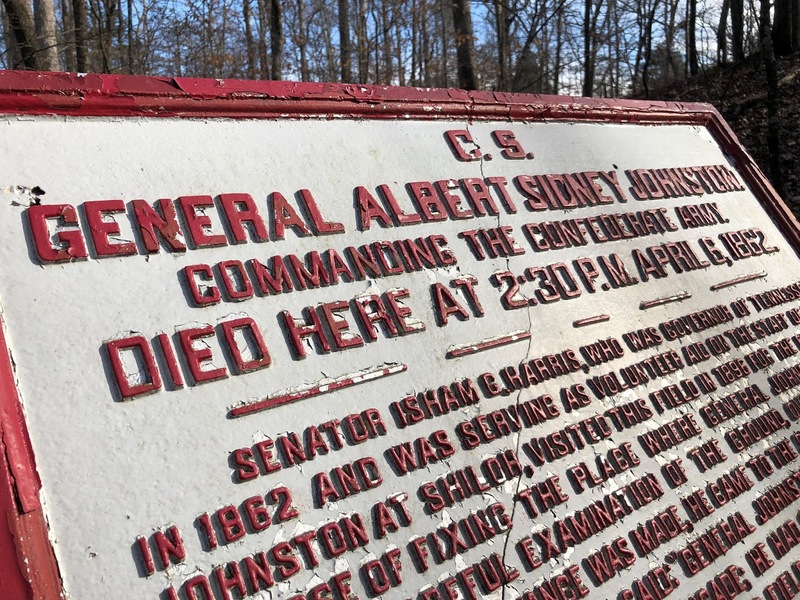 This cast-iron tablet near the Iowa memorial explains the meaning of many Shiloh battlefield markers. 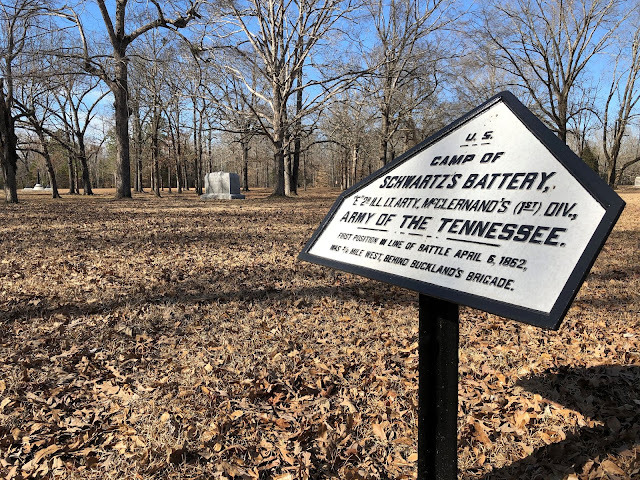 Roughly 600 of them stand stoically at attention throughout Shiloh National Military Park. Most are brittle, not unexpected given nearly all are well over 100 years old. They come in distinct shapes and sizes. Different colors, too. Sometimes they are targets of thieves or victims of wayward drivers or fallen tree limbs. Others suffer from ravages of time or weather. The marker for Bloody Pond features a coating of red paint. 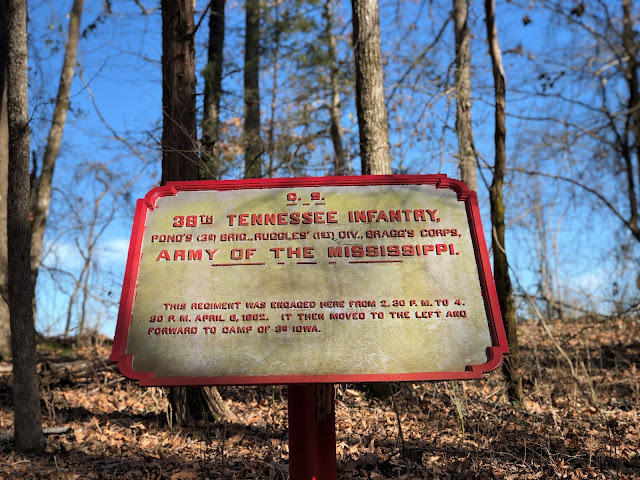 But these silent guides, the battlefield markers of Shiloh, are invaluable, providing information on camp sites, battlefield positions of units and armies and other significant locations. The positions of most of the cast-iron markers in the park were designated by the veterans themselves, ensuring their accuracy. 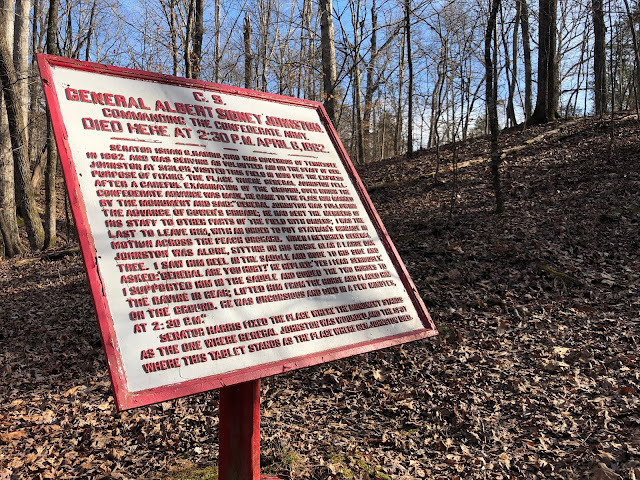 Steps from the Iowa memorial, a marker explains the meaning of other markers: large rectangular tablets give historical significance about armies and units engaged; rectangular tablets mark troop positions on April 6, 1862, the first day of the two-day battle; and oval tablets mark troop positions on April 7. 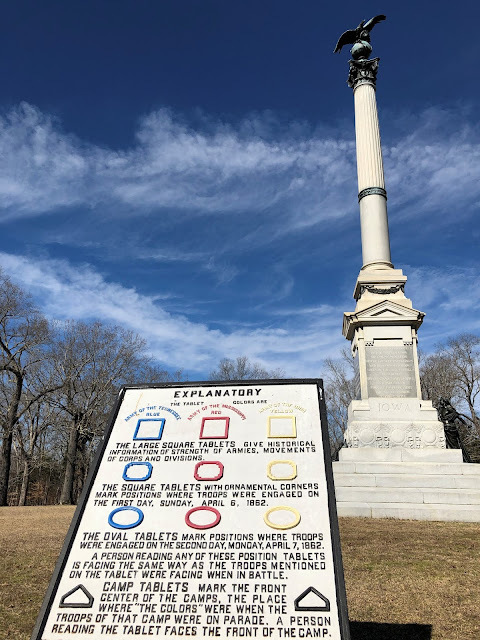 Yellow markers denote the Union Army of the Ohio, red the Confederate Army of the Mississippi, and blue the Union Army of the Tennessee. 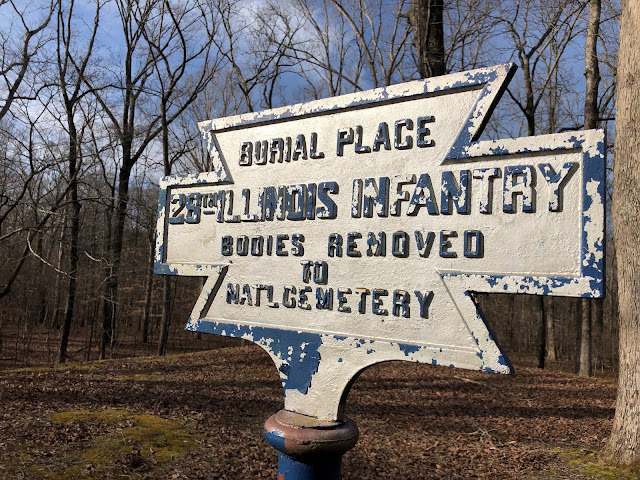 Irregular pentagon-shaped signs, painted black and white, denote camp sites. 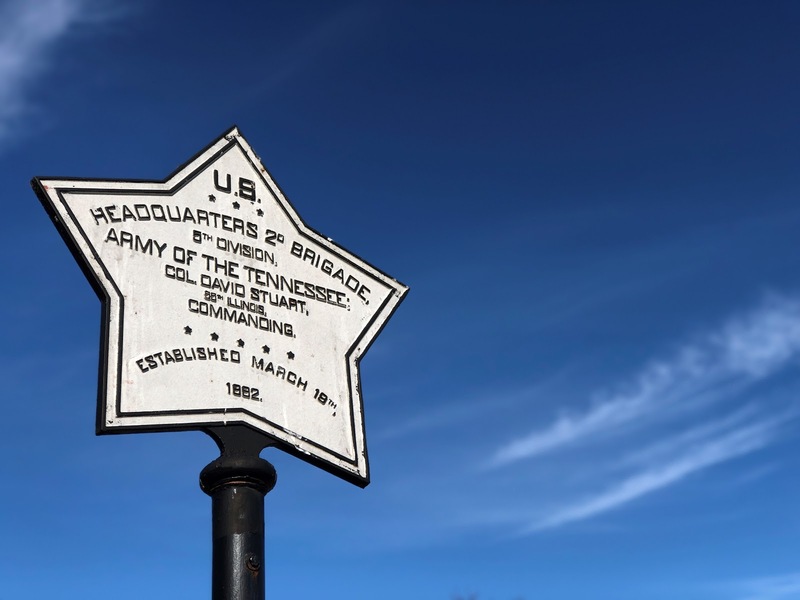 Star-shaped markers denote headquarters of Union brigades or divisions. 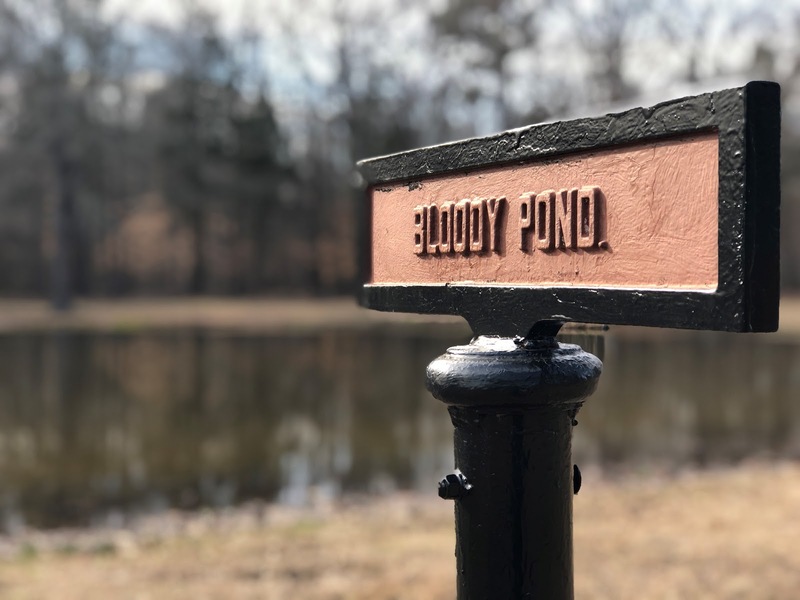 The vast majority of markers were installed in 1900-1901, after the park was created in December 1894. At the time, they cost about $25. 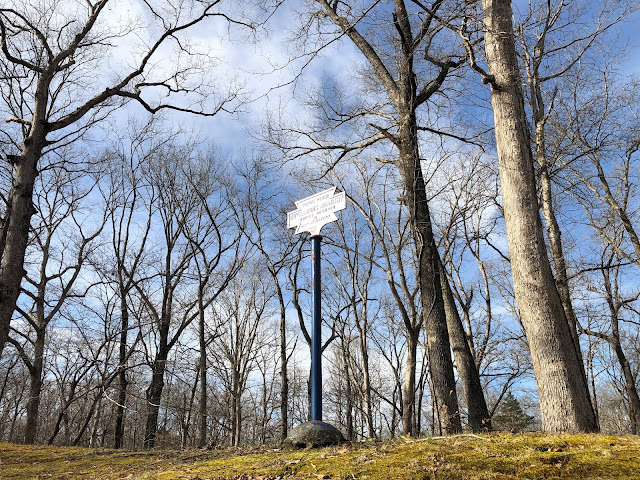 A replacement marker and pedestal today can cost as much as $5,000, plus labor and installation. 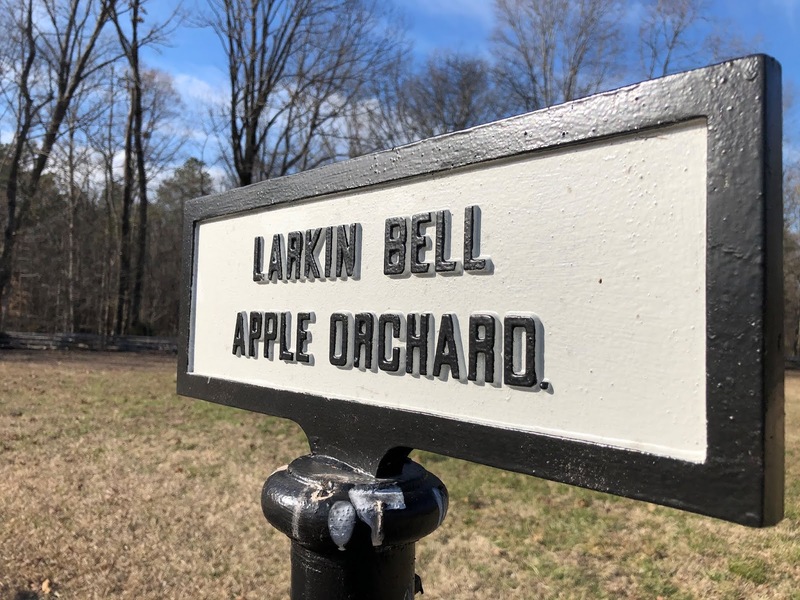 Nearly 100 of the markers have been replaced over the years. This marker denotes one of the more popular sites at Shiloh. Some markers, such as this one for the Confederates' 38th Tennessee, are off the beaten path. 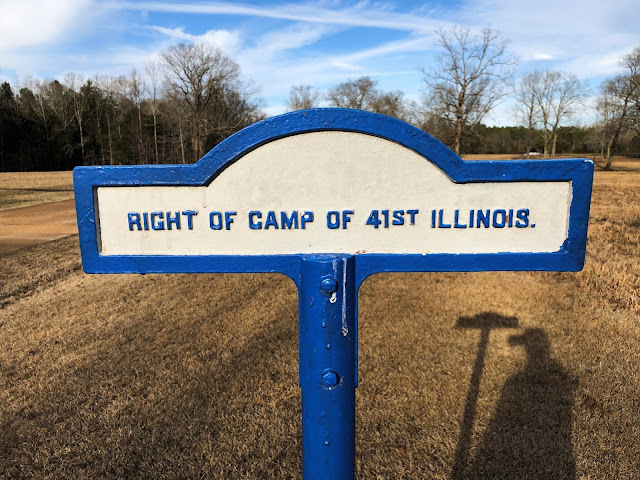 The headquarters marker for Union III Brigade, commanded by Colonel Leonard F. Ross of the 17th Illinois. The cannonballs are Civil War-era surplus ordnance. This tablet in a ravine marks the death site of Confederate commander Albert Sidney Johnston. of Confederate forces in the Western Theater was mortally wounded nearby on April 6, 1862. 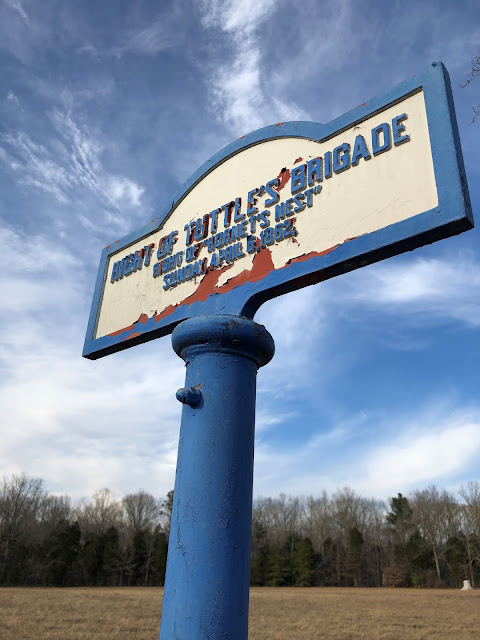 Apparently recently painted, this marker denotes a significant battlefield location. 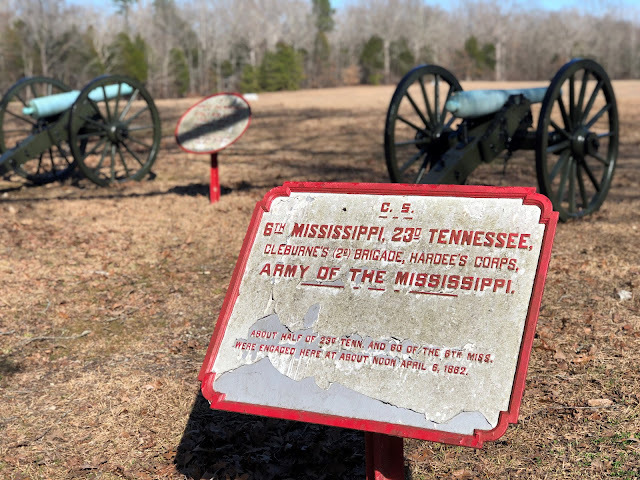 Tennessee, Mississippi soldiers in Patrick Cleburne's brigade fought here April 6, 1862, the battle's first day. The marker for James Tuttle's Union brigade could use a fresh coat of paint. 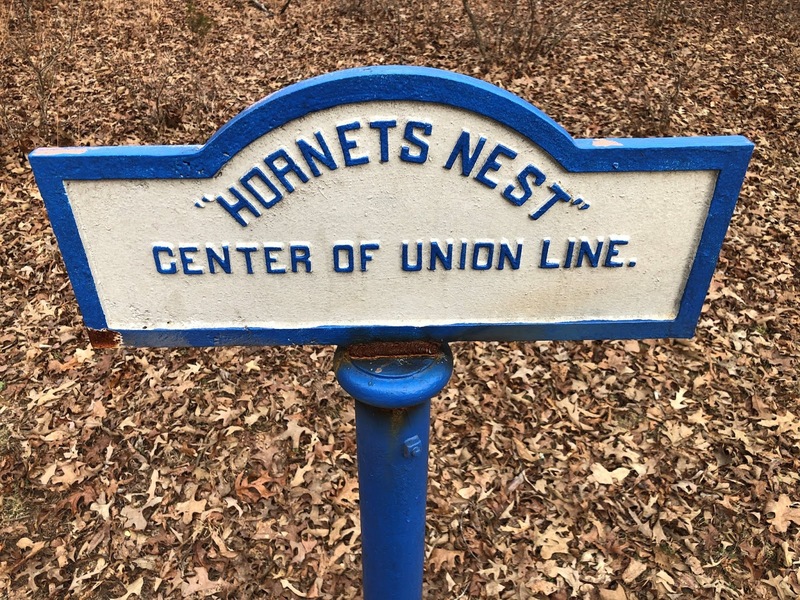 A five-sided sign -- an irregular pentagon -- designates the site of a Union artillery camp. Even the position of campsites for regiments are marked at Shiloh. A marker for the former burial site for 28th Illinois soldiers is atop an ancient Indian mound. at the national cemetery. It is located on a Tennessee River bluff, a short distance away.